Most Famous yacht cruise to the fort Aguada. 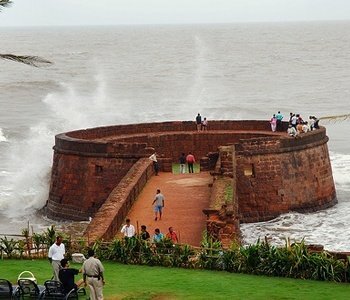 It is located between Sinquerim beach and river Mandovi.You can’t miss the fort Aguada while visiting Goa. It's quite impressive to see the fortifications of this Old Fort. Take a hike up the hill along the coast and enjoy the scenery. The fort itself, sits high on a hill with great views across Agauda Bay/Mandovi River to Panaji on one side to views across the Arabian Sea on the other. The walls are 5 meters high and 1.3 meters wide and you can walk along the top. Also on the fort is a 4-storey lighthouse, which you can climb to the top for great views of Sinquerim and Candolim beaches. Specially for those who are looking for adventure while they are honeymoon holidaying in Goa. Currently at one end of the fort, the central jail of Goa has been made. Fort Aguada is fascinating fort in Central Goa not far from Candolim and Calangute. I recommend getting there early in the morning by Private yacht, because the sun beats down on the fort later in the day. Wear sunscreen and a hat. A freshwater spring within the fort provided water supply to the ships that used to stop by.